FC Halifax Town youth team training session at The Inspire Centre, Calderdale College. Head coach Steve Nichol. Town beat Staveley Miners Welfare in the preliminary round 4-0 earlier this month, but were knocked out of the competition by Stocksbridge two seasons ago. Head of youth development Steve Nichol is hoping around 300 Town supporters attend on the night, which he feels would be a valuable experience for the club’s youngsters. He said: “It’s always enjoyable playing at The Shay and it helps the players feel connected to the club. “We want the players to progress into the first-team and a big part of that is psychological - getting used to playing in front of bigger crowds. “We have some very good players and it would be good for the supporters to see them in action. 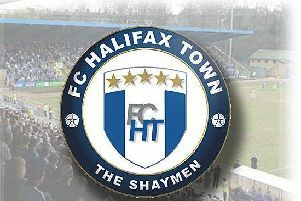 The youth team won their first league game of the season on Wednesday night, beating Preston 2-1 at The Shay. But Nichol says the FA Youth Cup is their man focus. “It’s a nationally recognised competition and everyone aspires to reach the first round proper when the bigger teams enter,” he added.